Crystal Fraser is Gwichya Gwich’in, originally from Inuvik and Dachan Choo Gèhnjik, N.W.T. She is currently completing a PhD in Canadian History at the University of Alberta in Amiskwaciwâskahikan (Edmonton, Alta.) on Treaty 6 territory. I belong to a growing body of Indigenous people who are increasingly alienated from our ancestral territories, with our cultural land-based teachings sometimes far removed from our everyday lives. I consider myself privileged to be able to return to my lands in Treaty 11 territory, sometimes known locally as Nanhkak Thak and more commonly referred to as the Mackenzie Delta, deep in the heart of Gwich’in country. The trip is not an easy one from my current home in Amisk- waciwâskahikan (Edmonton, Alta. ); it involves three flights, a drive on the infamous Dempster Highway, and a glorious ride on the mighty Nagwichoonjik (Mackenzie River). In 2012, after a 20-year hiatus, I had disembarked onto that sandy beach at Diighe’tr’aajil where I joined my mentor and cousin, Alestine Andre, at her camp. Heading up Nagwichoonjik (the Mackenzie River). My great uncle Gabe Andre told a story of a Gwichya Gwich’in man and his Inuvialuit counterpart who gambled at this site in a match where the winner would take all of this land. The Inuvialuit man won the match, and from that moment on this camp was named Diighe’tr’aajil, which translates to “where somebody lost everything” or “they took everything away from him.” But despite the devastating loss, I believe that my Gwich’in relative was still remarkably wealthy. He presumably had his health, diverse on-the-land skills, a nearby fishing eddy with a near-unlimited food supply, and an expansive kin network (with the spiritual, animal and human worlds) that would ensure his well-being. Although I was anxious that in my return to this land I would somehow fail to meet the expectations of my cousin, I relearned several childhood lessons over the next few days: how to read willows as they swayed in the wind, the power of human-animal relationships through my conversations with the neighbouring shoh (bear), and how language is critical to understanding Gwich’in worldviews. My experience with łuk (whitefish), however, etched a new relationship onto my soul, one that I had failed to see as a child. These activities were integral to our survival. Without me realizing it, my relationship with łuk began in the early 1980s, across the river from Diighe’tr’aajil, at Dachan Choo Gèhnjik. Dachan Choo Gèhnjik is a special site, where my jijuu, Marka Bullock, cut thousands of łuk, raised a village of children, and spent a good deal of her life, which spanned the years 1929 to 2013. Marka, along with her mother (and my diduu), Julienne Andre, managed the small community and healthy fish economy at Dachan Choo Gèhnjik with precision and expertise. A part of their success was nurturing the relationships between children and łuk; hauling, cleaning, cutting, hanging, smoking and bailing fish (and the endless other chores!). These activities were integral to our survival. Perhaps my favourite childhood pastime with łuk was extracting and drying gyùu (scales) and then harvesting the proper berries to dye those small discs the proper colour that allow them to shimmer in the sunlight on a finished piece of artwork. Decades now stood between those experiences and me. 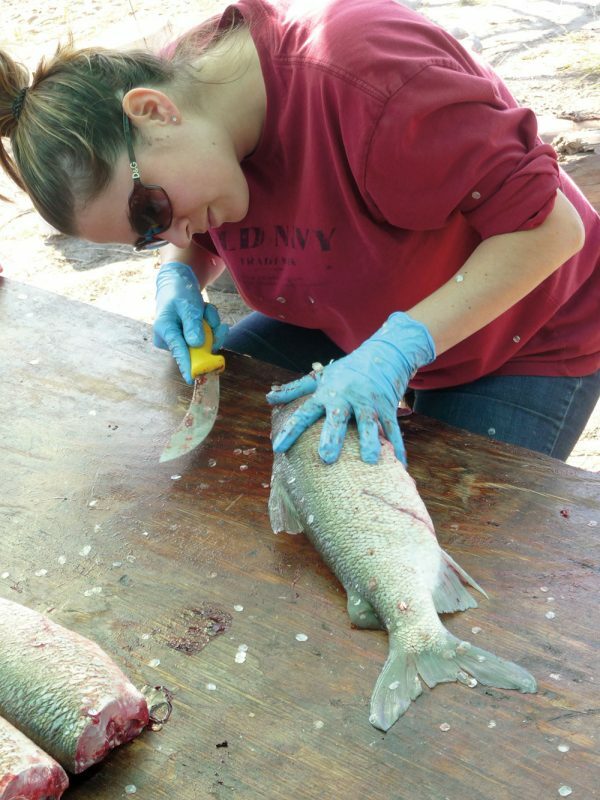 Author Crystal Fraser cutting łuk at camp. My modern apprenticeship at Diighe’tr’aajil began as “camp cook,” and I learned the delicacy of cooking its’igoghoo (charred, but buttery whitefish “guts”). Soon, I graduated to hauling łuk up the bank and then even checking the net with my cousin. Before too long, I had my own place at the fish-cutting table with a new knife that Alestine had gifted me for the special occasion. Setting the net. Collecting and hauling łuk. Cutting łuk flesh (sometimes coming at the expense of my own!). Gathering dahshaa for the smokehouse. Taking care to avoid making sounds that would attract rutting moose. This was all work that was exhausting, exhilarating and sentimental. When my ancestors entered into Treaty 11 with the Crown in 1921, they were unable to predict the future and, indeed, tragic events have unfolded over these past 97 years: disease and epidemic, residential schools, the near abolition of land-based economies, violent and invasive resource extraction. All of this considered, łuk are still here. With us. They accompany us on our journey down the Nagwichoonjik, lodge themselves in our nets, provide sustenance for our families, appear in our dreams as we sleep, and figure prominently in our most famous legends. With my time coming to a close at Diighe’tr’aajil, we travelled across the river to the Bullock camp. Dachan Choo Gèhnjik had profoundly changed over the last two decades; there was a new and inconvenient sandbar blocking the “traditional” entrance, purportedly caused by a dredging barge. 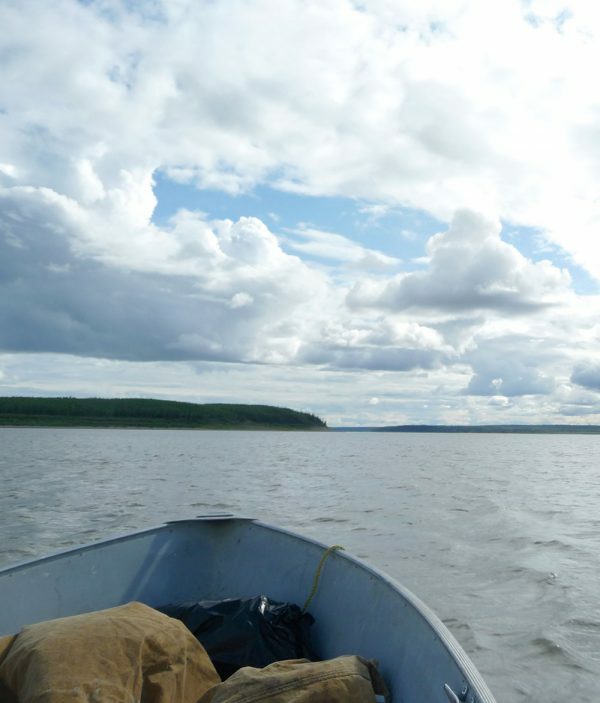 Once we landed and the boat was anchored, I walked up the steep hill where Marka’s children had once beaten down a path, running up and down to greet visitors and collect łuk from the canoe. The camp was entirely overgrown by willows, fireweed and tall Arctic grass. The smell of rotten wood overwhelmed my senses as I walked through the old wooden cabins and listened to the abandoned clothesline cable flicker in the wind. I inhaled sharply as I re-enacted the now-fabled story of my grandmother shooting a shoh square between the eyes in the pitch-black night at this site decades earlier, attempting to keep her kin safe. “What has become of us?” I wondered, philosophically. Coming to terms with the emptiness of it all, I thought to myself, “Maybe Dachan Choo Gèhnjik should have been the site where my Gwich’in ancestor ‘lost everything’?” But then I looked down the path to the shore and recalled myself as a child scampering up and down, screaming with my cousins about whose turn it was to collect water. And I could almost hear Marka sternly scolding me as I attempted to cut my very first łuk when I was four years old. “Never waste!” she exclaimed. And the many evenings when my diduu curled up on the bed (a wooden pallet) she found the most comfortable, and told us stories as she smoked her sweet-smelling pipe tobacco. Diduu’s stories were always in Gwich’in since she did not speak English, but we hung onto her every word. At 96 years old, Diduu always slowly faded off to sleep, during what we always thought was the best part of the story, but when a small puff of smoke emerged from her pipe, we knew that the story was not over. Diduu was among the first to forge new relationships with missionaries during the late 19th and early 20th centuries. Marka and her siblings attended residential school in Fort Providence, where she lost her sister, Angele. My mother, Juliet, attended Grollier Hall in Inuvik and was among the last in our family to be fully subjected to federal schooling policies that sought to extinguish our cultures and families. Despite all of this, I smiled and nodded to myself, knowing that one day I would bring my own family back to Dachan Choo Gèhnjik. But on that particular day, I was content to return to Diighe’tr’aajil, the place where we supposedly “lost everything,” to continue cutting łuk.